Where else can you experience the snow of Alberta and British Columbia on the same run? Located in Banff National Park, Sunshine plays host to skiers and boarders from all over the globe and has sure come a long way in the last 80 years. From a modest log cabin built by the Canadian Pacific Railway (CPR) in 1928, to greeting its first skiers in 1936, Sunshine has become a dream resort with 12 different lifts including 8 super lifts and a high speed gondola. Skiing Sunshine is such a great experience alone because of the views. Located above the treeline, you have the opportunity to see the peaks from the peaks. These vistas are usually saved for mountain climbers, but are just waiting for you as you ride to the top! 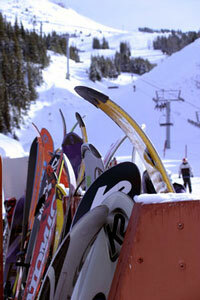 We planned on an afternoon of skiing at Sunshine Village, one of the largest ski resorts in Canada. It is located just 15 minutes from Banff, going west on the TransCanada Highway. Sunshine Village is a pretty historic place and as a sk resort it dates all the way back to 1936. 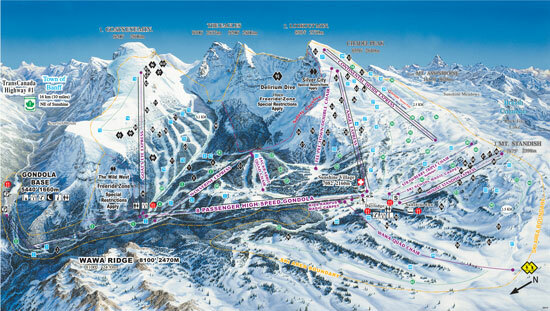 With over 3,300 acres of skiable terrain Sunshine Village is one of the largest ski resorts in Canada. The top elevation is 8,954 feet (2730 m) and the base elevation is 3,514 feet (1070 m). It receives a huge amount of natural snowfall: up to 33 feet or 9 m. Skiing usually lasts from mid November all the way to late May. 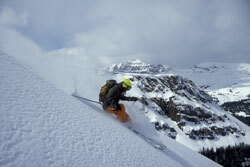 This resort straddles the Continental Divide and some of the runs are in Alberta and some in British Columbia. 107 runs spread out over 3 mountains (Goat's Eye Mountain, Lookout Mountain and Mt. Standish). The whole area is serviced by a high-speed 8 passenger gondola that whisks you from the parking lot up to the main village. In addition, there are also 5 high-speed quad chairs, 2 quads, 1 triple, and 1 double chair and 2 magic carpets. 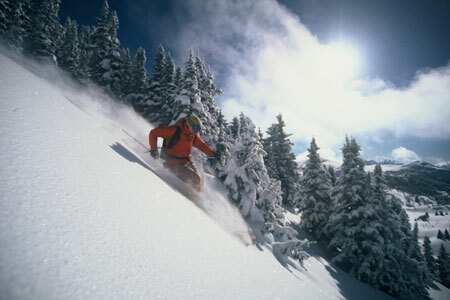 Sunshine Village also offers extreme terrain for really expert skiers. Delirium Dive is an expert ski area that requires special safety equipment and precautions such as being equipped with an avalanche transceiver, a shovel and having at least one other person with you. 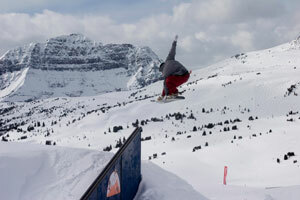 Goat's Eye Mountain offers a number of highly challenging double-black diamond runs that should be mastered before you even consider venturing into this area. At our level we decided to stick to the blue runs, which on this snowy day with lots of accumulated snow were plenty challenging enough for us. Every trail had turned into a mogul run, with all the extra piles of snow that had been carved into bumps by the other skiers. It was basically snowing the whole day with the sun peaking through in between the snow flakes. The night before 10 cm of fresh snow had fallen, and during the day several more centimeters got added. All the extra snow made this a really great workout, and we had to work really hard to push the white powdery stuff around. The Banff National Park is unique in that it restricts development and there are no sprawling condominiums at the base of any of the 3 Banff area ski resorts. It is almost a throw-back to an earlier time when skiing was less commercialized. The only ski-in/ski-out accommodation is at the recently renovated 84-room Sunshine Inn, located in the main village of the Sunshine Village Resort at an altiude of 7082 feet. Ski Canada has referred to the Sunshine Inn as "the best rooms with a view in Canada!". For those with an appetite Sunshine Village offers a variety of culinary options: the Creekside Bar & Grill is located the gondola base. 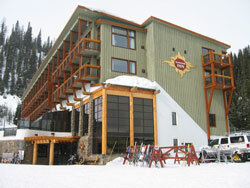 The Deli, Alpine Grill and the Lookout Bistro are all located in the Day Lodge in Sunshine Village. The Java Loft Coffee Bar and Chimney Corner Lounge are located in the Sunshine Inn while the Mad Trapper's Saloon can be found in the Old Sunshine Lodge. Goat's Eye Gardens is located right next to the Goat's Eye Express and offers cafeteria style food. An interesting feature of this resort is that it offers a SnowHost program, an absolute free program for visitors, that are welcomed by a team of frontline ambassadors for Sunshine village, all dressed in yellow and black outfits. Every day at noon the SnowHosts take skiers / riders out on tours using blue runs and show them how to access this monstruous ski area. We spent most of the afternoon in the Lookout Mountain (top elevation: 8954 feet or 2730 m) and Mt. Standish areas, going up the Angel Express and the Wawa Quad Chair. There are many blue and green runs available in this area which was helpful on this challenging day. After a rest in the Goat's Eye Gardens cafeteria and a sinfully filling portion of poutine, a truly Canadian culinary treat that combines French fries with curds and gravy, we felt strong enough to tackle Goat's Eye Mountain which offers mainly single and double black diamond runs. By that time it was about 3:30 and after getting safely down the mountain we decided to make our way down to the Gondola Base. We skied down a picturesque green run called Banff Avenue all the way to our car, surrounded by peacefulness in the forest. About the author: Susanne Pacher is the publisher of Travel and Transitions a popular web portal for unconventional travel and cross-cultural connections. Check out our brand-new section featuring FREE ebooks about travel.